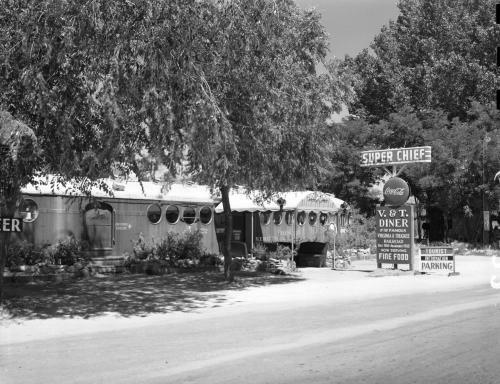 The Super Chief Diner sat in north Carson City, at the northwest corner of Long and Carson Streets. It wasn't an ordinary diner, though. 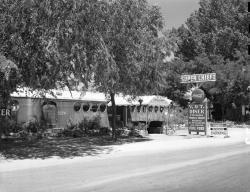 It was built out of the body of the McKeen Motor Car that ran on the Virginia and Truckee Railroad for 35 years. After the car was retired in 1945, it was converted first into Denny's Diner, several blocks south of here, then into the Super Chief. 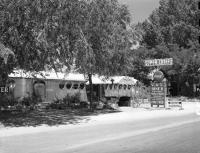 In 1955 it was moved again, to become offices for a plumbing shop at the south end of town. The Super Chief's sign bills it as the "V&T Diner - Of The Famous Virginia and Truckee Railroad - Now Serving FINE FOOD". They also have tourist information and parking, and serve Coca Cola. The McKeen Motor Car has been beautifully restored at the Nevada State Railroad Museum in Carson City.